Display Towers are favorites for presenting your products in an appealing manner where they can be easily seen. Freestanding glass display cases in open store areas allow customers to look at the products from all angles before making a purchase. 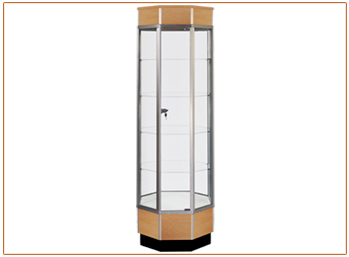 Octagon Display Towers are 24” square and 72” high (78” high with optional crown). Glass display area is 60” high with a hinged glass door with a lock. The base is 8” high with a 4” high black kick base. Display Towers come complete with 4 adjustable full depth glass shelves. To view more Tower Displays from the Streamline series, click here.